Why drivers in China intentionally kill the pedestrians they hit: China’s laws have encouraged the hit to kill phenomenon. 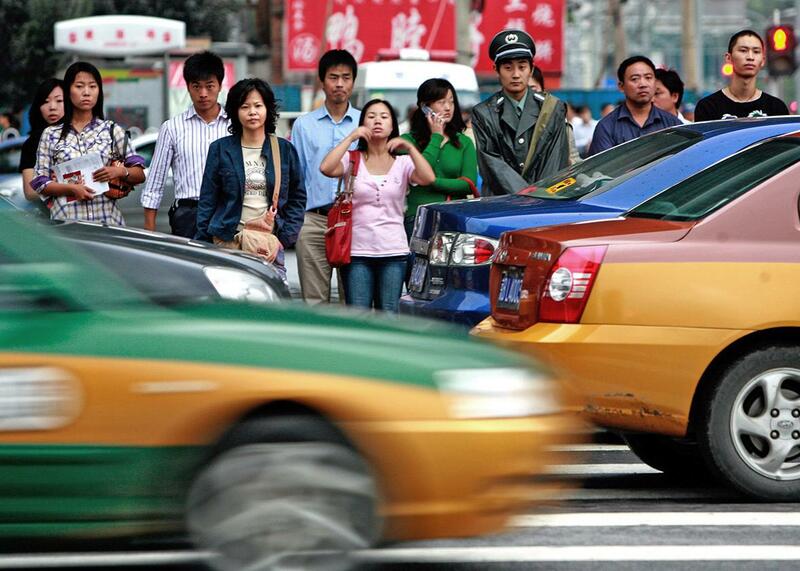 Look both ways: Pedestrians wait for the light to change in central Beijing on Sept. 18, 2007. This 2008 television report features security camera footage of a dusty white Passat reversing at high speed and smashing into a 64-year-old grandmother. The Passat’s back wheels bounce up over her head and body. The driver, Zhao Xiao Cheng, stops the car for a moment then hits the gas, causing his front wheels to roll over the woman. Then Zhao shifts into drive, wheels grinding the woman into the pavement. Zhao is not done. Twice more he shifts back and forth between drive and reverse, each time thudding over the grandmother’s body. He then speeds away from her corpse. Most people agree that the hit-to-kill phenomenon stems at least in part from perverse laws on victim compensation. In China the compensation for killing a victim in a traffic accident is relatively small—amounts typically range from $30,000 to $50,000—and once payment is made, the matter is over. By contrast, paying for lifetime care for a disabled survivor can run into the millions. The Chinese press recently described how one disabled man received about $400,000 for the first 23 years of his care. Drivers who decide to hit-and-kill do so because killing is far more economical. Indeed, Zhao Xiao Cheng—the man caught on a security camera video driving over a grandmother five times—ended up paying only about $70,000 in compensation. In 2010 in Xinyi, video captured a wealthy young man reversing his BMW X6 out of a parking spot. He hits a 3-year-old boy, knocking the child to the ground and rolling over his skull. The driver then shifts his BMW into drive and crushes the child again. Remarkably, the driver then gets out of the BMW, puts the vehicle in reverse, and guides it with his hand as he walks the vehicle backward over the boy’s crumpled body. The man’s foot is so close to the toddler’s head that, if alive, the boy could have reached out and touched him. The driver then puts the BMW in drive again, running over the boy one last time as he drives away. Here too, the driver was charged only with accidentally causing a person’s death. (He claimed to have confused the boy with a cardboard box or trash bag.) Police rejected charges of murder and even of fleeing the scene of the crime, ignoring the fact that the driver ran over the boy’s head as he sped away. These drivers are willing to kill not only because it is cheaper, but also because they expect to escape murder charges. In the days before video cameras became widespread, it was rare to have evidence that a driver hit the victim twice. Even in today’s age of cellphone cameras, drivers seem confident that they can either bribe local officials or hire a lawyer to evade murder charges. Perhaps the most horrific of these hit-to-kill cases are the ones in which the initial collision didn’t injure the victim seriously, and yet the driver came back and killed the victim anyway. In Sichuan province, an enormous, dirt-encrusted truck knocked down a 2-year-old boy. The toddler was only dazed by the initial blow, and immediately climbed to his feet. Eyewitnesses said that the boy went to fetch his umbrella, which had been thrown across the street by the impact, when the truck reversed and crushed him, this time killing him. Despite the eyewitness testimony, the county chief of police declared that the truck had never reversed, never hit the boy a second time, and that the wheels never rolled over the child. Meanwhile, one outraged website posted photographs appearing to show the child’s body under the truck’s front wheel. In each of these cases, despite video and photographs showing that the driver hit the victim a second, and often even a third, fourth, and fifth time, the drivers ended up paying the same or less in compensation and jail time than they would have if they had merely injured the victim. Of course, not every hit-to-kill driver escapes serious punishment. A man named Yao Jiaxin who in 2010 hit a bicyclist in Xian and returned to make sure she was dead—even stabbing the injured woman with a knife—was convicted and executed. In 2014 a driver named Zhang Qingda who had hit an elderly man in Jiayu Pass in Gansu province with his pickup truck and circled around to crush the man again was sentenced to 15 years in prison. Both China and Taiwan have passed laws attempting to eradicate hit-to-kill cases. Taiwan’s legislature reformed Article 6 of its Civil Code, which had long restricted the ability to bring civil lawsuits on behalf of others (such as a person killed in a traffic accident). Meanwhile, China’s legislature has emphasized that multiple-hit cases should be treated as murders. Yet even when a driver hits a victim multiple times, it can be hard to prove intent and causation—at least to the satisfaction of China’s courts. Judges, police, and media often seem to accept rather unbelievable claims that the drivers hit the victims multiple times accidentally, or that the drivers confused the victims with inanimate objects. Hit-to-kill cases continue, and hit-to-kill drivers regularly escape serious punishment. In January a woman was caught on video repeatedly driving over an old man who had slipped in the snow. In April a school bus driver in Shuangcheng was accused of driving over a 5-year-old girl again and again. In May a security camera filmed a truck driver running over a young boy four times; the driver claimed that he had never noticed the child. And last month the unlicensed woman who had killed the 2-year-old in the fruit market with her BMW—and then offered to bribe the family—was brought to court. She claimed the killing was an accident. Prosecutors accepted her assertion, and recommended that the court reduce her sentence to two to four years in prison. This light sentence would still be more of a punishment than many drivers have received for similar crimes. But it probably won’t be enough to keep the next driver from putting his car in reverse and hitting the gas.